TJ Formal Dress Blog: Dresses on the Red Carpet for the Oscars! Demi Moore and Elizabeth Banks wore similar layered-skirt dresses. In fact, I thought they were so similar, maybe they should have called each other first. I found a couple of prom dresses we carry that are pretty close. Blush 2010 Prom Dress 9047 has the dropped waistline and layered skirt. This dress is very popular this year! And Le Gala 2010 Prom Dress 110511 is a darker version of that layered type of skirt. Several stars, Kristen Stewart, Mariska Hargitay, and Giuliana Depandi wore dark, strapless dresses that looked very similar. Maybe stars need a dress registry just like prom girls! 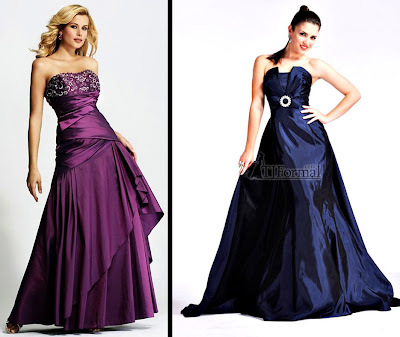 Examples of dark, strapless A-line dresses we carry are Jovani Evening Dress 710003275 and Jovani 2010 Prom Dress 15132 . Next time you are watching a big show with the Hollywood crowd, pay attention to what they are wearing. Chances are, you can get that same look right here at TJ Formal! I loved reading this and I always love looking at all of the red carpet reviews... TJ Formal has some very red carpet worthy gowns! Wow, that's cool to show look alikes thanks!!!! !